Man talking Hi. 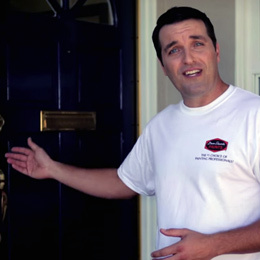 I'm Cole Schaefer, professional painter and welcome to Dunn-Edwards paints “how to paint” video series. A wooden deck creates an outdoor living space that can improve the value of your house. And over time the condition of a wooden deck deteriorates due to the outside elements, but with the use of some high-quality paint, your wooden deck can be transformed into an attractive area to enjoy again. In this video we'll share tips on how to properly prep and paint an exterior wooden deck. So first you'll want to look at your project and make sure you have the skill capability and equipment to do it, because painting an exterior wooden deck can be difficult. Depending on the scale and existing condition of your deck you may want to consider hiring a professional painter to paint it. Safety brochure clip Now if you decide to do it yourself your project may involve power or hand washing scraping sanding and priming be sure to consult Dunn-Edwards surface preparation safety brochure before you get started. Man talking So, begin by clearing the deck and removing any furniture and objects from the area, cover any plants in close proximity to your deck with plastic sheeting to protect them from damage, and sweep your deck with a broom to remove any loose dirt. Now depending on the condition of the deck you may need to power wash or hand wash your deck. Power washing is faster, but you need to be careful when using this type of the equipment. You can rent a power washer from your local equipment rental yard. Be sure to have the rental yard staff explain how to use the power washer and provide basic safety training. Now we're going to show you some basic steps to hand wash your deck you'll need a bucket wire brush cleaner and water. Pouring in bucket clip Pick an area to start, pour some of the cleaning solution on the deck and begin washing the surface using the brush with slight pressure to remove any loose paint or dirt. Use a light rinse to remove any residue. Continue this process until the entire deck is clean. Prepping deck for paint painters tape and cover all areas you do not wish to paint. At this point begin inspecting the deck for any loose boards and fasten before you begin painting, there's no sense in foregoing the opportunity to make minor repairs before you actually paint the deck. Now check for any nailhead rust, some deck stains will protect against rust but not all, be sure to read the product instructions. Man talking You may need to spot prime any nails with rust inhibitive primer before you paint. Now that all the prep work is done you're ready to start painting, but before you start here's a painting tip- avoid painting in direct sunlight if possible wait for a time of day when the area to be painted is in the shade. Why? Well heat from the sun will increase the temperature of the surface, this surface temperature, along with the ambient heat, will make the paint you're trying to apply dry faster and it will limit the amount of time you have to create a nice finish. Now you want to apply a minimum of two coats of premium exterior stain, and when you're painting your deck choose exterior stain that is manufactured for high-traffic areas and is mildew resistant. The approach for painting this deck is to paint from top to bottom. Painting deck You start by painting the ceiling first, the post and rail second, and the deck or floor last you want to use a paint roller to help apply the paint over a large area faster, so you can keep a wet edge, and brush out the paint for a smooth finish. painting deck clip for instance, paint this ceiling joist, and then that section of the ceiling, then paint the next joist and adjacent section. Man talking A good tip is to always paint from corner to corner, also don't try to paint too big of an area at once because it will be difficult to keep a wet edge. Man painting deck Use your brush to cut in the ceiling where there is contact with any walls, also cut in any corners you can't reach like along this corner, between this joist, and the tongue-and-groove ceiling. Once you've cut in these areas start rolling paint onto a beam, the wood on this deck has a deep grain texture so it will likely hide any roller textures. Test a small area to start, if the paint doesn't flow out clown. 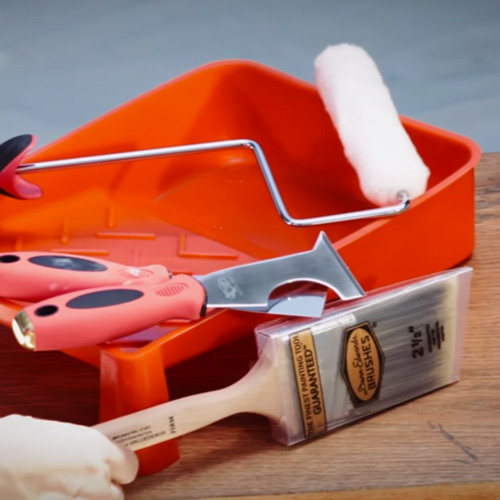 Use a brush to feather out the paint so it dries to smooth finish. I'll continue painting each ceiling section until the entire section is painted. Next it's time to paint the post and rails. Paint the first post top to bottom, cut in any corners. 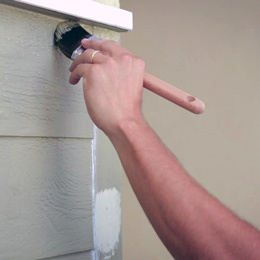 Use your roller to apply paint quickly to the post then, use your brush to feather out the paint for a smooth finish. Next, paint the adjacent rail section and work towards the next post. Start on the top rail by cutting in any corners, apply paint to the rails using a roller and lay off for a smooth finish. Now, once you've completed painting all the posts and rails it's time to paint the floor. Now, the trick here is not to paint yourself into a corner, and we're not kidding either. Now this might seem obvious, but it happens, so plan your escape routes so you finish painting in a section where you can walk off the deck. Now with the deck floor, plan to paint a few boards at a time, start by cutting in any corners where the decking touches the walls then apply paint with your roller cover and feather out with a brush. Man talking This deck floor is made with smooth milled lumber, so it will be important to brush out the paint to a smooth finish. Now keep repeating this process until you've painted the entire deck floor. Well there you have it, a great-looking new finish that will protect your deck for years to come. Now for more information on paint or painting watch the other how to paint' videos on dunnedwards.com/videos. For Dunn-Edwards paints, I'm Cole Schaefer, thanks for watching and happy painting you.